General Manager at Donut King, Nicholas Brill, says The Royal Range is the biggest shake up to the brand’s core product line in 30 years. “We have seen a market shift towards overindulgent donuts that are loaded with sweet fillings and are worthy of a dessert lovers’ Instagram feed,” said Brill. “We’ll never part with the warm cinnamon donuts we’re famous for, but we’re excited to shake up our offering with a new line of indulgent donuts,” he stated. 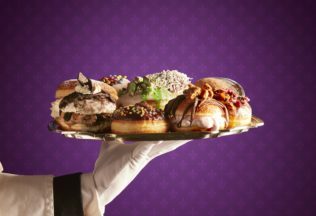 The Royal Range consists of eleven doughnut varieties including The Caramel Countess, Lady Hazel of Cinnamon, The Crown Jewels, King Confetti, The Orange Orb, The Marshmallow Monarch, Lady Appleby, The Duchess of Lamington, The Royal Wedding, Sir Mint-a-lot, and Her Majesty the Cream. All doughnuts in The Royal Range are available from Donut King stores across Australia. Donut King is part of the Retail Food Group which owns a variety of quick service food and beverage chains including Crust Pizza, Gloria Jeans, Michel’s Patisserie and Pizza Capers. Warrnambool Cheese & Butter has released its new Heritage Flavours range of cheeses.